[By Nick, New for June 2015] I'm currently in Harrisburg, PA visiting my family. My intentions were to hit up DQ as many times as possible seeing as there are none near me normally. However, I drove by a Baskin-Robbins and knew I had to stop for their flavor of the month. 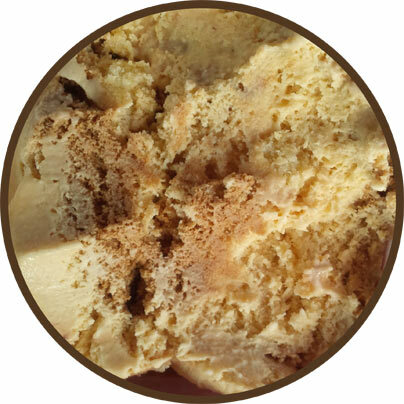 dunked within Dunkin’ Donuts coffee ice cream. I've been trying to get Dubba to review this flavor since it was announced. After a bunch of convincing, he went to try it and it wasn't in yet. Thankfully, this Baskin-Robbins had the flavor of the month freshly stocked for me. The description of this ice cream sounds awesome. Doughnut flavored ice cream and a chocolate icing ribbon? Yes, please! 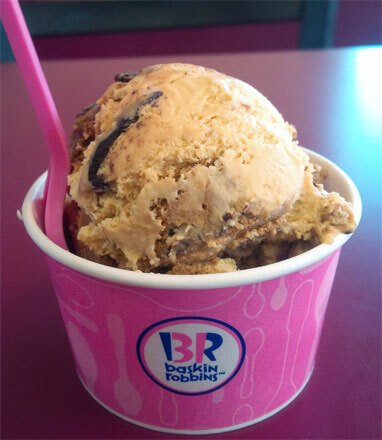 Fun Fact: This is the first time I've ever had Baskin-Robbins from a scoop shop. I've reviewed plenty of their grocery store line but never have I ever been to an actual BR. I blame the only one that was close to me growing up being almost an hour away where I now live and it closing down a few years back. Here's hoping my first experience isn't a bad one like some of Dubba's recent experiences. The ice cream looks good enough. And hey, it tastes even better! The ice cream tastes actually if you were to dunk a cake doughnut into a cup of coffee. The coffee flavor isn't super strong and it's one of the sweeter coffees I've had. Still, it's really good and they nailed the combo perfectly. The doughnut pieces are fresh and soft. They remind me more of cake donuts than of yeast risen donuts. These are much better than the horrid chunks I found in Sam's Choice's version. The chocolate icing swirl seals the deal. It brings in some more sweetness for sure but the chocolate's naturally bitter nature rounds everything out perfectly. It's not thick but it tastes like the icing you'd find on a Boston Cream doughnut and if that doesn't make you want to try this flavor, then there's nothing else I can possibly say. If you're near a Baskin-Robbins and like donuts and can tolerate coffee, I see no reason why you shouldn't try this flavor before it's gone at the end of the month. Verdict? Basically tastes like donuts dipped into a mocha coffee! Odd. You have never been to a dip shop and I have never seen BR in a store ever around Maryland. Never knew such a thing existed. You guys are all welcome for the coffee / donut flavor. I sent an e-mail to Baskin Robbins a few months back asking why nobody had bothered with a donut / ice cream combo. Guess this is what they came up with. Okay,I really can't honestly take the credit for it just because I sent an e-mail...But, I will. I also wouldn't have put nasty coffee in it. TheIcon, they just started producting 14oz pints and bars last year and I'm seeing them more and more in stores this year. TTB, take the credit but remember companies normally have their flavor set a year in advance;] Ben & Jerry's already know what they'll be producing in 2017 aha.